L'Express (French pronunciation: ​[lɛksˈpʁɛs]) is a French weekly news magazine headquartered in Paris. The weekly has a right-wing stance and has a lifestyle supplement, L'Express Styles, and a job supplement, Réussir. In 2014, Roularta sold L'Express to the Franco-Israeli billionaire and media-entrepreneur Patrick Drahi. 1 2 Peter Humphreys (15 May 1996). Mass Media and Media Policy in Western Europe. Manchester University Press. p. 88. ISBN 978-0-7190-3197-7. Retrieved 15 November 2014. 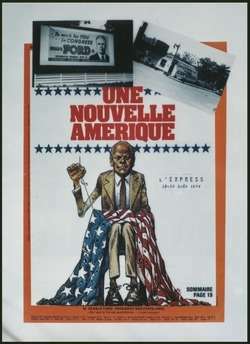 1 2 "L'Express". Roularta. Retrieved 1 November 2014. ↑ "Historical development of the media in France" (PDF). McGraw-Hill Education. Retrieved 24 February 2015. ↑ Richard Aplin; Joseph Montchamp (27 January 2014). Dictionary of Contemporary France. Routledge. p. 202. ISBN 978-1-135-93646-4. Retrieved 22 November 2014. 1 2 Christopher H. Sterling (25 September 2009). Encyclopedia of Journalism. SAGE Publications. p. 1009. ISBN 978-1-4522-6152-2. Retrieved 4 March 2015. ↑ Michael Mould (27 April 2011). The Routledge Dictionary of Cultural References in Modern French. Taylor & Francis. p. 513. ISBN 978-1-136-82573-6. Retrieved 31 December 2014. 1 2 3 4 "Weekly Magazines: Second in a Series on French Media". Wikileaks. 1 December 2006. Retrieved 1 November 2014. ↑ Christoph Fiedler (17 December 2012). "Processing for direct marketing in the context of the trade journal, magazine and newspaper sector" (PDF). Brussels: European Magazine Media Association. Retrieved 7 December 2014. ↑ "Making Le Point". Time, 27 November 1972. 1 2 Raymond Kuhn (7 April 2006). The Media in France. Routledge. p. 68. ISBN 978-1-134-98053-6. Retrieved 15 November 2014. ↑ "Le Vif/L'Express". VoxEurop. Retrieved 7 December 2014. ↑ "Top 50 Finance/Business/News magazines worldwide (by circulation)" (Report). Magazine Organization. Retrieved 13 December 2014. ↑ E. Martin (30 November 2005). Marketing Identities Through Language: English and Global Imagery in French Advertising. Palgrave Macmillan UK. p. 6. ISBN 978-0-230-51190-3. Retrieved 25 September 2016. ↑ "France -- Media Guide 2008" (PDF). Open Source Center. 16 July 2008. Retrieved 1 March 2015.